Daniel Abramowitz, MD, Oscar Henao, MD, Kai Shen, MD, Timothy D Jackson, MD, MPH, Allan Okrainec, MD, MHPE. Division of General Surgery, Univeristy Health Network, University of Toronto; Temerty/Chang Telesimulation Centre. Introduction: The Fundamentals of Laparoscopic Surgery (FLS) is an ideal training program for teaching basic laparoscopic skills. Students proceed through simplified tasks with progressive level of difficulty. Still, a steep learning curve exists for intracorporeal knot tying. The purpose of this study was to design a new model for teaching intracorporeal knot tying to act as an intermediate between basic hand eye co-ordination skills (FLS task 1) and intracorporeal knot tying (FLS task 5). We hypothesized the model would enhance learning of laparoscopic suturing through isolating and simplifying intracorporeal knot tying. 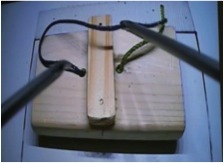 Methods: The model was built to fit inside a laparoscopic trainer box (Figure 1). Twenty medical students were randomized to learn laparoscopic suturing with intracorporeal knot tying for 1 hour on FLS task 5, or for the 30 minutes on the intracorporeal knot model, followed by 30 minutes on FLS task 5. Participants were scored based on total time and error using the FLS score on FLS task 5 before, during and after the session. A questionnaire was completed by participants assessing their perceptions in regards to the teaching models. Mean FLS scores were compared between the groups with a Student’s t-test. Results: Pre-test FLS scores were not significantly different between the control and intervention groups (2.5 vs. 3.8; p > 0.6). After the training session, FLS scores improved in both groups; however, FLS scores were not significantly different on the post-test between the control and intervention groups (69 vs. 71; p > 0.8). The intervention group completed 6.6 successful attempts, compared with 4.3 successful attempts in the control group (p < 0.05). Further, the intervention group found the model to be helpful (4.3/5; 1 – not helpful, 5 – very helpful) and worth recommending to other novice trainees (4.6/5; 1 – definitely no, 5 – definitely yes). Conclusion: Participants trained on the intracorporeal knot-tying model were able to perform a greater number of successful attempts at laparoscopic suturing than those trained solely on the FLS model. Although no objective differences were seen in in the post-test FLS score, subjectively, the model was found to be helpful and participants would recommend it to other novice trainees. Figure 1. Novel intracorporeal knot tying model utilizing contrasting ropes at fixed lengths to isolate and error proof intracorporeal knot tying.